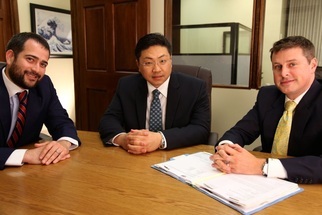 The attorneys at Strassburg, Gilmore & Wei, LLP are personal injury lawyers near Orange County and we've worked with nearly every possible type of accident case throughout Southern California. We work on a contingency basis, which means that we don't get paid anything until we've successfully settled your case, or brought it to a jury verdict. When you call Strassburg, Gilmore & Wei you will talk directly with one of our attorneys immediately, and our first priority is to get you to a doctor, chiropractor or medical professional... usually on the same day you contact us. Do you believe that your current attorney isn’t doing everything they should on your case? Maybe it’s time for a new perspective, call us now and have us review the details with you. Contact an Experienced Injury Attorney Near Orange County Today. We serve all courts throughout Southern California and can meet you at your home or hospital if you can’t come to one of our 3 office locations. Contact us today If you've been injured in an accident, to learn more about your rights or allow us to help you find out what your case is worth. Call (626) 683-9933 to talk to our injury lawyers immediately from your home, hospital or accident scene. We are Los Angeles injury lawyers who serve accident victims in: Los Angeles, Long Beach, Glendale, Santa Clarita, Lancaster, Palmdale, Pomona, Torrance, Pasadena, El Monte, Downey, Inglewood, West Covina, Burbank, Norwalk, Compton, South Gate, Carson, Santa Monica, Whittier, Hawthorne, Alhambra, Lakewood, Bellflower, Baldwin Park, Lynwood, Redondo Beach, Pico Rivera, Montebello, Monterey Park, Gardena, Huntington Park, Arcadia, Monrovia, Diamond Bar, Rosemead, Hollywood, Beverly Hills, Glendora, Claremont, Azusa, Rowland Heights and all cities throughout Orange County, San Bernardino County and Riverside County.